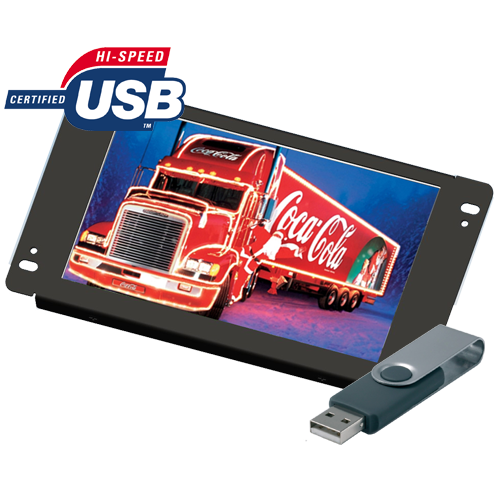 The Lilliput AD801/USB is an 8 inch open frame 16:9 LCD video advertisement playing system which can play video files directly from a USB stick onto its small, high definition screen. It can be used for simple rolling static advertisements, video loops, or for keeping up to date with local information. Direct and simple advertising on an affordable and dynamic platform, the entry level AD701/USB system is ideal for the small store front system - either as an independent advert player, or as part of a larger matrix to form a larger more impressive display. Advertising space that targets affluent and local demographics is a local advertiser's dream, meaning you can command premium advertising prices and offer your local markets a unique platform to advertise their wares. Installed in a retail space it will draw attention to products with low natural appeal and allow you to better market your slower moving lines. AD801/USB is a simple system that uses a locally modified USB memory stick to update your content. Modify your ad content - save to the memory stick and then plug and play.